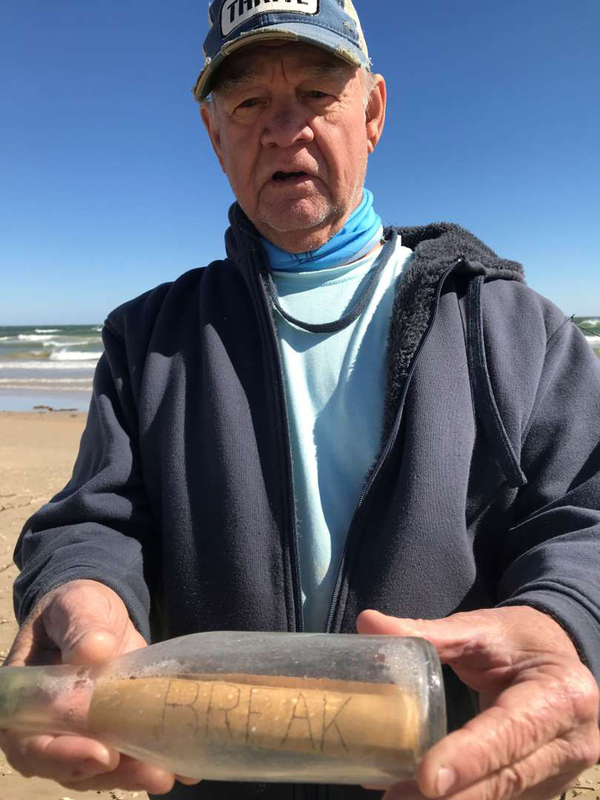 While beachcombing along the Padre Island National Seashore in Texas, Jim and Candy Duke discovered an old bottle with a message inside and were excited to get home to open it and find out what the message said. Little did they know at the time that the message in a bottle was from the U.S. government and a reward was being offered. The words BREAK BOTTLE could clearly be seen on the outside of the faded orange paper inside, but the Corpus Christi couple didn't want to break it. So, while filming live on Facebook about three weeks ago, they proceeded to open the bottle with a wine bottle opener and extracted the note with an ice pick and tweezers. "I keep thinking because it has a number on it maybe we've won some grand prize to some place, maybe a cruise, I don't know," Candy said in the video. "We don't want to break the bottle that's why we're trying so hard to get this cork out. We collect bottles from the beach and we have them going down Jim's fence in the backyard…This is harder than I thought." It did take quite an effort but Candy finally got the message out of the bottle. Alas, the Dukes did not win a cruise, but there was a reward. 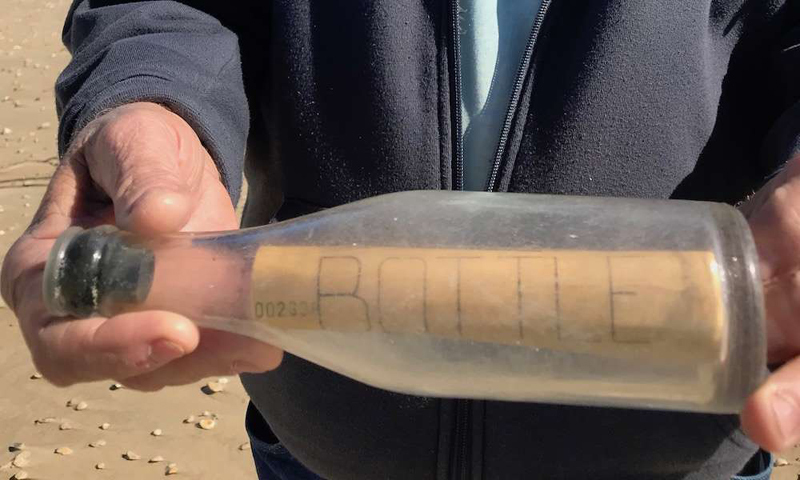 The bottle is one of 7,863 bottles that were released in the northwestern Gulf of Mexico from February 1962 to December 1963 by scientists at the Galveston Laboratory of the U.S. Bureau of Commercial Fisheries (now known as NOAA Fisheries). Each bottle contained a note instructing the finder to break the bottle and mail in the enclosed post card after filling out the date and location of the bottle to claim a .50 cent reward. The releases were part of a study to determine the role that water currents play in the movement of young shrimp from offshore spawning grounds to inshore nursery grounds. Asked if they submitted the card for the reward, Candy told FTW Outdoors, "Yes, I submitted the card. That's what got their story rolling. They sent me paperwork on the results of the study!! So exciting. This is the most exciting thing we've found. But we have hundreds of ropes. Nets. Bottles and odd things we have found that adorn our fences." 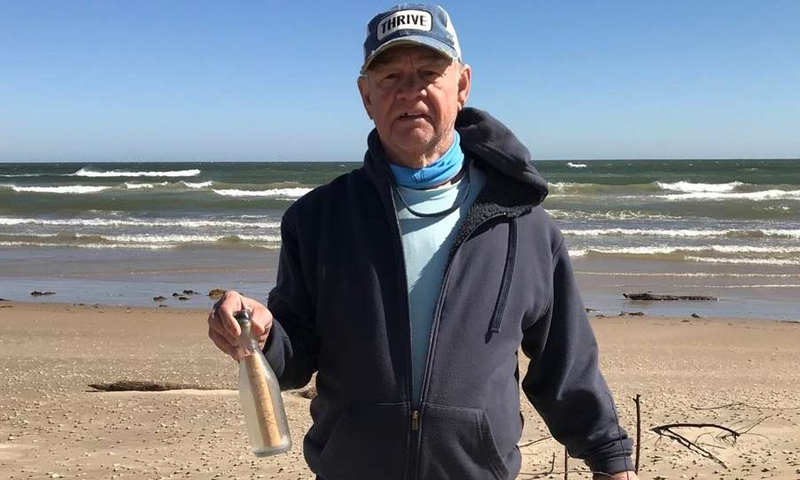 According to the drift bottle study published in May 1979, scientists dropped bottles into the water from chartered shrimp vessels each month at various locations over the continental shelf from New Orleans to the U.S./Mexico border during the course of the study. Of the total 7,863 bottles that were distributed, 953 or 12 percent were recovered within the first 30 days after release. The one the Dukes recovered was at sea for more than 56 years. "My husband almost didn't pick up the bottle because it was small and white," Candy told FTW Outdoors. "We typically want colored bottles or ones with a design. He picked it up and thought someone stuffed it with corks. Then we realized it was a faded note but never thought it could be 50 years old." As it turned out, they didn't collect the reward. Candy told NOAA Fisheries to keep the 50 cents. Photos courtesy of Candy Duke.